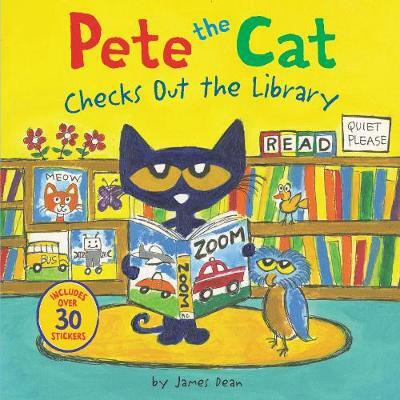 New York Times bestselling author and illustrator James Dean shows us how much fun reading can be in Pete the Cat Checks Out the Library. Includes over 30 groovy stickers! It's Pete the Cat's first time at the library. New York Times bestselling author and illustrator James Dean shows us how much fun reading can be in Pete the Cat Checks Out the Library. Includes over 30 groovy stickers! It's Pete the Cat's first time at the library. He gets a fun tour of library and even reads a few super cool stories while he's there. Without even leaving the library, Pete goes on so many groovy adventures. All Pete needs is a little imagination-and of course, his library card! A great introduction to the library from everyone's favorite groovy cat.